Valentine’s Day is next week and Safeway has a fabulous price on bone-in ribeye steaks this week, just $5.77/lb. Since it’s not really grilling weather, I am going to make my ribeye steaks in the oven. My family has told me that they actually prefer the steak cooked in the oven because it retains it’s juices and yields and more flavorful steak! It’s really easy to do and all you need is a cast iron skillet and a hot oven. 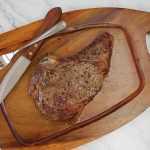 I have personally cooked steaks in the oven many times and my biggest tip is make sure you turn on the fan in your hood or on your range because there is a fair amount of smoke generated by the sizzling fat in the skillet. So, avoid setting off the smoke alarm and turn on the fan before you open the oven door. 1. Place 12-inch cast-iron skillet in the oven and heat the oven to 500º. Let steak rest on counter for 10-15 minutes. 2. When the oven reaches 500º, remove the skillet and place on stove top over high heat for 3-4 minutes. Rub steak with oil and sprinkle both sides with salt and pepper and oregano (if using). 2. Place the steak in the middle of the skillet. Cook 30 seconds. Flip steak and cook another 30 seconds. Place pan in the oven for 3 minutes. Flip the steak and cook for additional 3-4 minutes (3 minutes for medium-rare, 4 minutes for medium). 3. Place the steak on a plate, squeeze the juice of half a lemon over it (if using) and cover loosely with aluminum foil. Let rest for 3-4 minutes. Serve. Tender, juicy cast-iron ribeye steak is easy to prepare and the only way to go in the winter when it's too cold to grill! Place 12-inch cast-iron skillet in the oven and heat the oven to 500º. Let steak rest on counter for 10-15 minutes. 2. When the oven reaches 500º, remove the skillet and place on stove top over high heat for 3-4 minutes. Rub steak with oil and sprinkle both sides with salt and pepper and oregano (if using). Place the steak in the middle of the skillet. Cook 30 seconds. Flip steak and cook another 30 seconds. Place pan in the oven for 3 minutes. Flip the steak and cook for additional 3-4 minutes (3 minutes for medium-rare, 4 minutes for medium). Place the steak on a plate, squeeze the juice of half a lemon over it (if using) and cover loosely with aluminum foil. Let rest for 3-4 minutes. Serve. 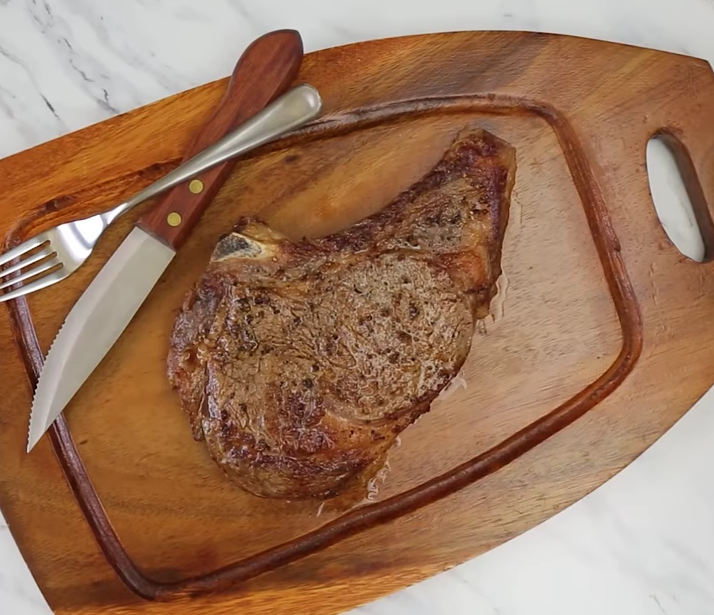 Watch this video for how to cook a ribeye steak in the oven: See all our other Weekly Meal Deal Recipes here. Thanks to our friends at Safeway for letting us share this video with you.